I can't remember how many times I have been out places & wondered, sometimes even to this day, actually how cold or hot a place I was in was! I don't want to wonder anymore. Does anyone use these and do you know if these things are any good, or how accurate they are? I ask because some brands are not cheap and some are. Are there any particular brands that are considered good quality with these mini zipper pull compass/ thermometer tools? I would not be expecting to rely on it for serious navigation, but it would be a good thing to have as a back up, for cross checking a main compass and to check temperatures, especially now winter is here. I have a mini Suunto compass I clip to my G-Shock watch which is excellent quality. Its made in Finland and has jewelled bearings. I noticed Suunto made a zipper pull compass/ thermometer at one stage, called the comet. That compass also had jewelled bearings & I think the thermometer was mercury. Sadly, it seems to have been discontinued, probably due to costs. I couldn't find much on you tube about these and Amazon reviews are 'all over the place', as usual. The brands I found so far are; Sun Co. (a classic US brand for these)- Sun Co. offer them in a glow-in-the-dark case (weighs 12 grams), in birch wood or even brass, which seems a nice touch. Another one I saw is made in Japan by SHINWA that uses alcohol, not mercury for the thermometer and only weighs 9 grams. 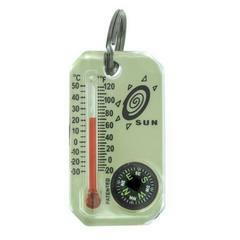 A Sun Co. (glow-in-the-dark) zipper-pull Compass and Thermometer, made in USA. A SHINWA zipper-pull Compass & Thermometer, made in Japan. Sure Know what you mean. I tend to wonder what the more expensive ones are made of anyway, I mean where the parts come from. Many of them seem so 'similar' its hard to tell. Maybe they are one of those hit and miss items- You know, kind of like those things you use to got in a show bag as a kid, where your brothers' worked & yours didn't And even as a kid you could have strangled the manufacturer! Excellent post! I forgot about that Silva one you have there, they seemed good. Believe it or not, but the Amazon review of the Sun are only 3/5 stars! Coughlans seems better. Yeah, that one is defiantly made in Japan - the Ebay seller was really helpful with it. He basically said just don't trust your life with it. But who knows, the Japanese's ordinary could be our luxury! I'm currently reading these forums at the moment. This guy was also hoping to find a quality mini thermometer (BTW, doesn't have to be 'zipper pull', just compact & lightweight). Whilst I like kit that has multi/purpose/functionality, I reckon you could probably accurately guess the temperature to within 5 degrees and that seems to be as accurate as those thermometers read. Using a cricket calculator may be more accurate still, depending on when and where you are. More expensive thermometers add weight and unless you are intent on data logging take a while (10 minutes) to stabilise, but then you would want to know pressure etc. I have the Suunto clipper which is quite good for its size although take a long a proper compass when you buy one or compare it with others in the shop as the first one I bought was way off. Yeah, well that is the point of this thread. Thrud. I & others are trying to find a good portable thermometer Its not something I've really looked into before, as mentioned above, so I am entering it with an open mind. I was aware that most 'good' thermometers are usually on the bigger size & fragile, but technology does change, especially if you haven't been following thermometers per say. In fact the Silva thermometer Randall has is suppose to be one of the better smaller thermometers, according to reviews, but its a little heavy for my liking. As for your comments on Celcius, I & I'm sure others have always spelt it that way & I will continue to do so. (And it is spelt differently according to the Oxford dictionary). I've since ditched the compass combo idea, as most are northern hemisphere calibrated anyway, & as you say they seem to be inaccurate. I have no problem waiting 10mins to read the temperature, its seems that's an American thing, like not waiting 10mins for a billy to boil I already have a Sunnto compass, as mentioned. Just looking for a reliable thermometer now. If you read the link above, one hiker seeked the same thing I did- he found there is a thermometer that is portable, small, reasonably lightweight & is accurate to withing 1 degree- It also costs about the same as a Sun Co. keying tool, but unlike it it is used in science labs! Personally, and as the basis of my post indicated & using examples, I am not interested in fancy data loggers, digital thermometers or Krestel thermo's - Accurate thermometers do exist that don't need all that stuff, have for years & don't cost an arm & a leg to buy. What I meant by the spelling of Celsius was that it was probably a knock-off. Silva is a Swedish company and you would hope they knew how to spell the name of one the the great Swedish astronomers Anders Celsius. Thanks. But I think it is the same deal as the others, save the survival gear, which I have anyway. I might go for this one. I also heard some phones have electronic thermometers, you can access with an app. I know I said I didn't want an electronic thermometer, but I am thinking of how many things the phone can do & also acts as a back up & safety device & it can charge my headlamp. Will have to see.